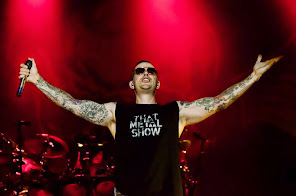 Avenged Sevenfold News: M.Shadows: "You know anytime you get to share the stage with..."
M.Shadows: "You know anytime you get to share the stage with..."
8. Give me a current artist you would like to jam with. You know anytime you get to share the stage with Metallica it’s a good thing. If you’re playing with Metallica you know it’s gonna be in a stadium, that’s nice.